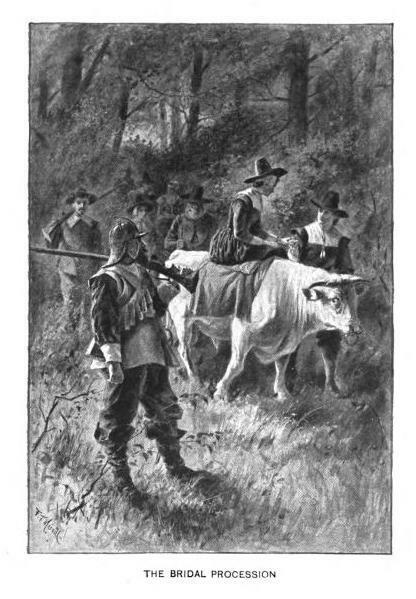 If John Alden’s life and legacy is influenced by good old Henry W. Longfellow’s poem The Courtship of Myles Standish, Miss Mullins life is even more overshadowed by legend. This afternoon I’ll share the very few historical details we do know and why Priscilla Mullins has always been interesting to me. Researchers think she was born about 1602 in the County of Surrey, England. William and Alice Mullins were her parents and she may have had three siblings. In 1620, Priscilla Mullins, her parents, and (probably youngest) brother Joseph boarded the Mayflower. They were “strangers” and not necessarily seeking religious freedom in the new world. It’s the classic story of a family trying to rebuild or make new lives in America for some reason, but for Priscilla that chapter of the story didn’t end happily. After the Mayflower reached Cape Cod and the men signed the Mayflower Compact, colony building began. But in the winter months, deadly sickness swept through the settler’s ranks. Priscilla’s father, mother, and brother died – leaving her orphaned, alone, and without family protection in an already difficult situation. She survived. Priscilla would have moved in with one of the other families and spent her days looking after the children, helping with the cooking and numerous chores, and probably helping to plant the fields and gardens. She would have helped the other women (including Elizabeth Hopkins) prepare the massive amounts of food for the “First Thanksgiving.” Only four older women had survived the sickness. Priscilla found herself in an odd situation; unmarried, without family, and very young – probably just barely twenty. Around 1622, she married John Alden. She lived in the houses he built in Plymouth and Duxbury. She gave birth to ten children who would survive to adulthood. She worked hard in her home and colony. She died sometime between 1651 and 1687, leaving no other solid records or even a date of her death. John Alden and Myles Standish shared lodgings in their bachelor days at Plymouth. Priscilla Mullins was probably the only (or one of few, depending on actual ages which can be hard to determine) young, unmarried women in Plymouth in the early months of that colonies history. John Alden and Priscilla Mullins got married. The Aldens and the Standishs both moved north and founded the town of Duxbury – so they were probably friends? Once upon a time, my family hosted a “Pilgrim Feast” for several homeschool families. It was a yearly tradition, started when I was about five. By the time I was eleven or twelve, I’d started doing special educational presentations and trying to interpret the lives of the Plymouth settlers. In my teens, the research became more solid and the interpretation more exciting with skits, interviews, and all kinds of activities when I tried to never break character. I portrayed Desire Minter and Mary Chilton, always careful to choose girls close to my own age. But I was waiting and waiting until I turned eighteen and could portray Priscilla Mullins. She was the goal, the prime role I wanted to play. Why? I don’t know if I have a good reason. I just wanted to be Priscilla Mullins at our Pilgrim Feast. I think – whether you believe Longfellow’s version or not – there is something irresistibly romantic about her story, but her history is also a story of survival, courage, tenacity, and resilience. I wanted to portray that in a historically accurate, feminine way. I never really got the chance. Life happens. Our traditional Pilgrim Feasts came to an end as the students got older and busier. Sometimes around Thanksgiving, I have a few regrets that I never got to “be” Priscilla Mullins, never got to share her story with the students. Then, I think about my life and what I admired in her life. I think about how much hardship she survived, how hard she worked, how alone she might have felt at times – so much harder than my troubles and life challenges. And I start to realize that I don’t need to “play” Priscilla Mullins. The best qualities that I admire from her life and story I strive to live every day. That’s how history can inspire us. Not with poetic fables, but by understanding and thinking about the gritty realities of the past and the people who had the courage to survive and build their lives in a new land.